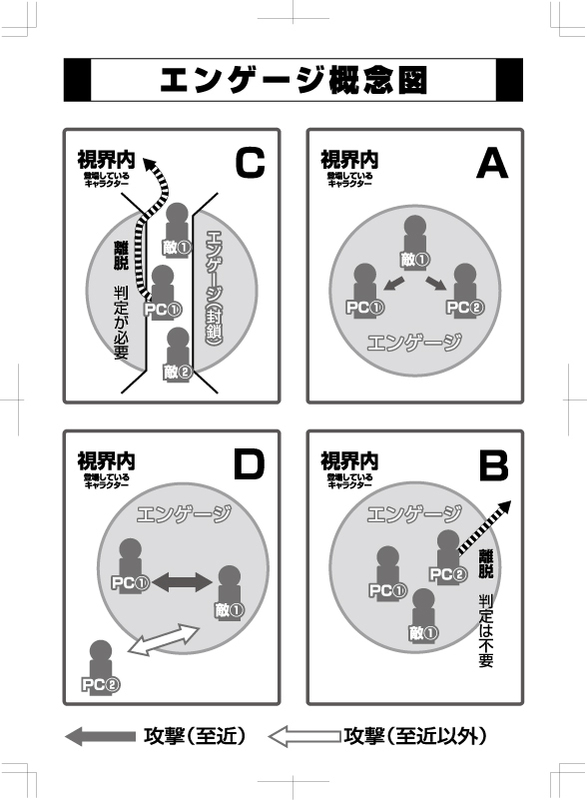 So, I finally sat down and read the 移動とエンゲージ (movement and engagement) rules in SRS (F.E.A.R.‘s house system), and it turns out they’re very simple and kind of interesting, so I thought I’d post about them here. In SRS characters that are within melee range of one another are in an “engagement” (Figure A). If you’re in an engagement with an enemy, you have to take a Withdrawal action (離脱; Figure B), but that takes up a Full Action rather than a Minor Action like normal movement, so you can’t attack during a turn you move out of an engagement. You don’t normally have to make a roll to do a Withdrawal, but if you’re trying to do so through a confined space or in a place where it will otherwise be difficult, you’ll need to make a suitable check (what attribute depends on the particular SRS game, but generally something like Agility). Finally, ranged attacks can indeed go to and from outside of an engagement (Figure D). That’s a quick summary, but I don’t think I’ve really left anything out. This is an interesting way to handle combat rules and movement. One of the biggest pains I’ve found in RPG design is striking a balance between using miniatures to track movement exactly and just handwaving away movement and distance altogether. Can you tell us more about SRS? I’d like to hear a general idea of how leveling and abilities works in this system. The very basic core of SRS is that for action resolution you roll 2d6 and add your attribute bonus, trying to beat either a target number set by the GM or an opponent’s result. In true SRS (i.e., the games labeled as such rather than the ones with very similar rules that came before they adopted the name) you make a character by distributing three character levels among 1 to 3 classes (all in one class, 2 and 1, or 1 in three classes). You then add up the bonuses from each of these to get your base attribute scores (you get a small number of points to distribute freely). The number you actually roll with is the base attribute divided by 3 (rounded down), so a typical character bonus can range from +1 to +6 or so to begin with. Each class has several Skills associated with it, and characters get a certain number of these. They’re analogous to powers in D&D4e (but they creep into the territory covered by Feats too, with some “Passive” skills giving flat bonuses). Characters accumulate XP and level up, and with each new level you get to raise your level in one class. It has HP and typically MP or something similar, so a lot of active skills have an MP cost(though some very powerful ones are limited to one use per scenario), and tends to be relatively traditional overall, but nifty in a lot of little ways. In you personal view, how good is the srs? I mean, is it user friendly, to complex, simple and quick, etc..? Man we should have something of this and SW in english! I haven’t yet played any SRS games, but based on reading it SRS is a solid but not *hugely* remarkable system. It is more or less traditional, if with a few touches that are distinctly Japanese. The approach to character creation is probably the single most interesting thing about it, since it both speeds up the process immensely and gives characters distinct and flavorful abilities to choose from. What really makes F.E.A.R.’s games interesting is the kinds of evocative worlds they come up with. And believe me, I definitely want to help get some such games out to people in English, but if it happens it will take some time. I know about Andy’s project on Tenra, gotta say i thrilled by it,when the preorder goes i’m planing to give it a shot. Also I have bought Maid and I liked it a lot, quite a funny game! You have my full support on your projects good work, keep it up!